Back issues of SEE 2016 Issue 32A do not carry CME credit. Valuable compendium of knowledge based on the medical literature. Portable paper versions only. This activity is intended for anesthesiologists and anesthesiology residents. Researchers and other health care professionals with an interest in anesthesiology may also participate. 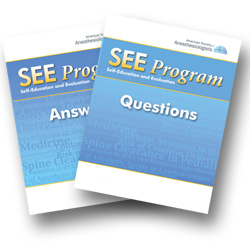 NOTE: Residents can purchase back issues of SEE at the same discount as current issues - call (630) 912-2552 for more information.